Enfield riflei at Wecdon Anenal Await proof after being bought by Interarmco. ingtnu. ]>. C.. from a vantage jn>inl across the Potomac River. Bui the big guns, ranging from 3-inch antiaircrafts tni hulking tiC-puti infers. are iti friendly hands. Knglith-maile relies nf World War I, [he cannon were recently imported by Interarmco., the Alexandria, Va., firm known lo American gun fans ¡is I he source for 'Lescry-ihing from muskets lo machine guns." Complete with sights and idlicr accessories, the field pieces are destined for sale to collector«, njovle studios, museums, and "big horc families" in general. a rm en's Virginia headquarters. 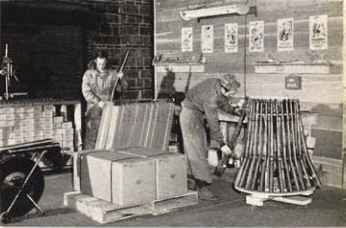 < it her company guns blasted in London and Birmingham, There, in ¡he British gun trade proof houses, thousands of .303 Enfield rifles were being tested with heavy overloads liefore shipment to L;, S, sportsmen. 'Hie Brilish government, following cutbacks in its infantry force levels, put a targe lot of En fields up for sale last spring. Intcrarmco purchased ihe entire lot through a London affiliaic in the largest such small arms transaction ever completed. actiihi. fastest of ihr turning holt t>pe, is in great demand there for sporting use. and s|ntr|er conversions arc the "bread and butter" of Conimiiriweullh gunsmiths. With the En fields Came a quantity id pistols and revolvaft acquired by I lie British a I the time of Dunkirk, or captured during ft 11 rid Wat If. Included were Luger*. Mausers, rare Italiener Molina .4Ss <■■ f Argentine 111 a mi fa dure, prewar Llama (xnikct autos in tbi:ir original boxes, and other handguns which I'.iigli-li Ian makes it praetieally ini|iosiibJr for a private citizen to own. Hidden iu a few crates were a handful of Coll Nm y Models, some choice flattop Bisleys, and 1'Ht Colt Single Action Army» in numbered pairs. These "finds, considered loo small to advertise, were sold lo dealers here and abroad. The great majority id ilie handguns were proved, inspected, and then shipped lo Inlera mien's U, S, warehouses for w holesale d istril wtiou. British law requires slriet proving of ali exported arms, despile I heir original military lesls. Proving is done at boTidon and Birmingham undet supervision of the Ministry of Supply. Riles and pistols are proved with luads dc' veloping 30 to 45 |ier cent more pressure than standard aumiunitioii, ami each gun must also pass I he "Vi^W11—a del ailed ins|>eCtiou of its action ami barrel tie fore and after firing. Intcrarmeo*! facilities are keyed to transactions of this sije. The firm is both the postwar pioneer in volume tratling of surplus military arms, and I lie Largest domestic disiribu. tor. It was the primary contractor of two other major imports, the 7,35 mm Italian Careano < MJJC) and the (¡.5 rum Swedish Mauser (M94) i-arluncs. 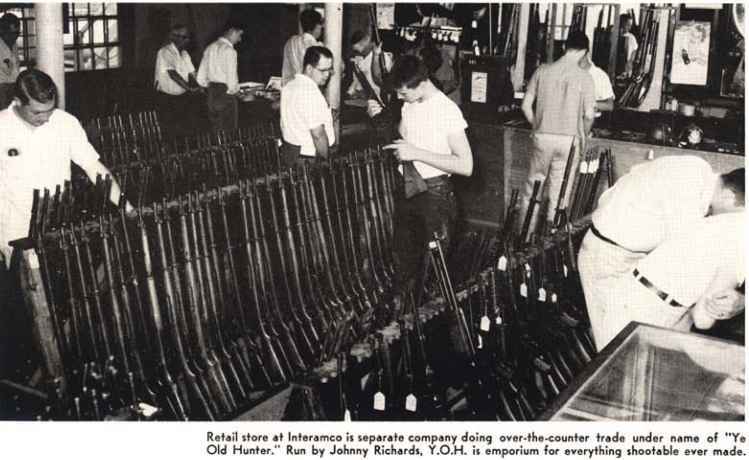 Retail store at Interamco ii separate company doing over-the-counter trade under name of "Ye Old Hunter." Run by Johnny Richards, Y.O-H, is emporium for everything shoo table ever made. 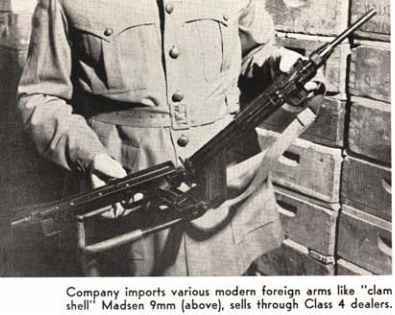 Interarm prexy Sam Cumnrtings has big collection of one each of every gun firm has imported, Top three are Enfields; then Johnson, U, 5. and Jap Garand, Weither and Mauser WWII auto rifle i. 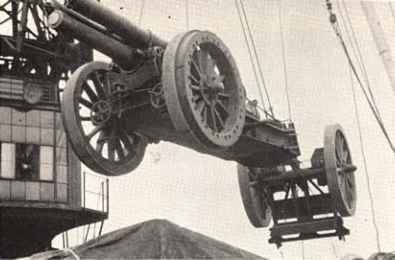 Huge British field gun is lowered to dock in Alexandria, Vfl. Gun is one of doiens bought by Interinnco in Irish deal, for sale here. Swedish Mauser M94 carbines are packed for shipment to large mar! order chain that sold thousands. are handled from company offices i" London and Geneva. Gunsmithing and icmanufacttiring for foreign governments are hat idled iaxgely through an ájfiliale, Cogswell & Harrison Lid. of London, Britain's largc-i gun house. Inter-araico also has SEt11-^ offices and representatives in ihr vari-mis European and Soulh American capitals and in some African and Asian countries. Home base is u complex of offices, warehouses, dock and railroad facilities overlooking the Nation's Capital in historic Alexandria, Virginia. Here eight large warehouse buildings are Ihmkcd by docks and tracks: munitions from all corners of the glohe are unloaded on I heir ''sea side,'1 checked, processed ami then shipped inland by rail or truck on I he Other. The interior of these guarded buildings is a gun luigTs paradise. Here one can lind a fully armed Vampire jet cratcd for export, a display of the latest Anna lite. CETME, ami F.N. 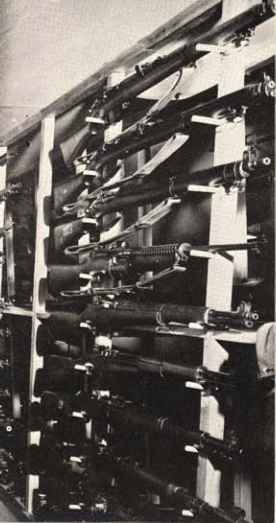 automatic rifles, various machine weapons for police and the military, and neat racks of American, Austrian. Belgian. British. Czech, Egyptian. German. Italian anrl Spanish ex-military rifles for sah- to the sporting public. ■\ retail "Yo Oíd Ilunter" gun store, and Potomae Vrms, a mail orrlcr house for military arnis parís nearby huildiiigs. 0|>eraled fcy Jotin C< Richards, ihesc firma are separóte f roí ti Intcranneo huí sell man y of iis ínventoly i lema. Inte ra ni ico is purposciy located near Washington beca use tile importitig of artns is one of llie most closeiy controllcfl I . 5. industries. Importo and exporls ¡tre made only muler individual iiccnscs from tbc State Pcparlmcrit. 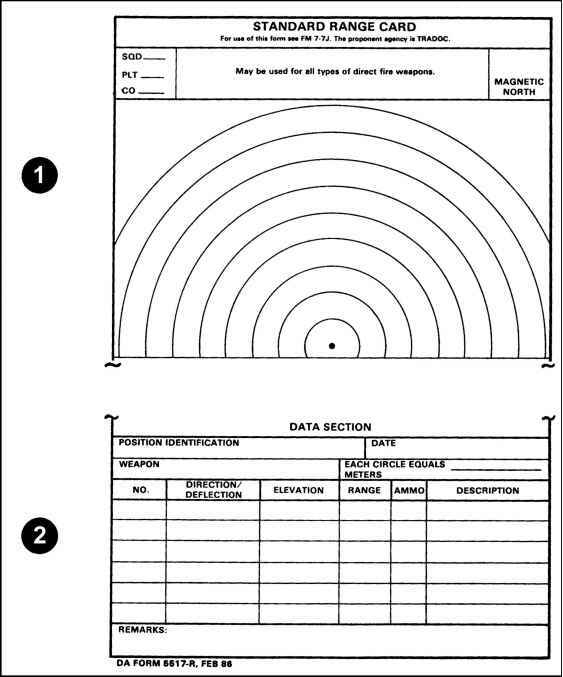 The dotnestie snlc of automatfc weapon» is aisn undtr supervisión of ihe Treasiiry. A sepárate Intcrarmco división. under Bear \dmirat C. L. G. Atkesun ilSVret,) deaís with llie intricacies of govemmcntal regulations.